What is Laminated Image Glass: It is a series of Layers Arranged Between Two Pieces of Glass, Pressure and Heated in an Industrial Autoclave. This process Liquefies the Clear Adhesive, Bonding the Inner Layers Together into a Coheasive Unit. This process allows us to introduce a specially printed image between the layers of glass, and dramatically alter the way decorative glass can be used. 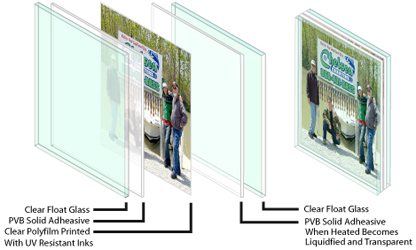 This process is applicable to large format compositions, windows, door lites and a variety of applications. It is also an ASTM certified safety product for industrial and commercial applications.